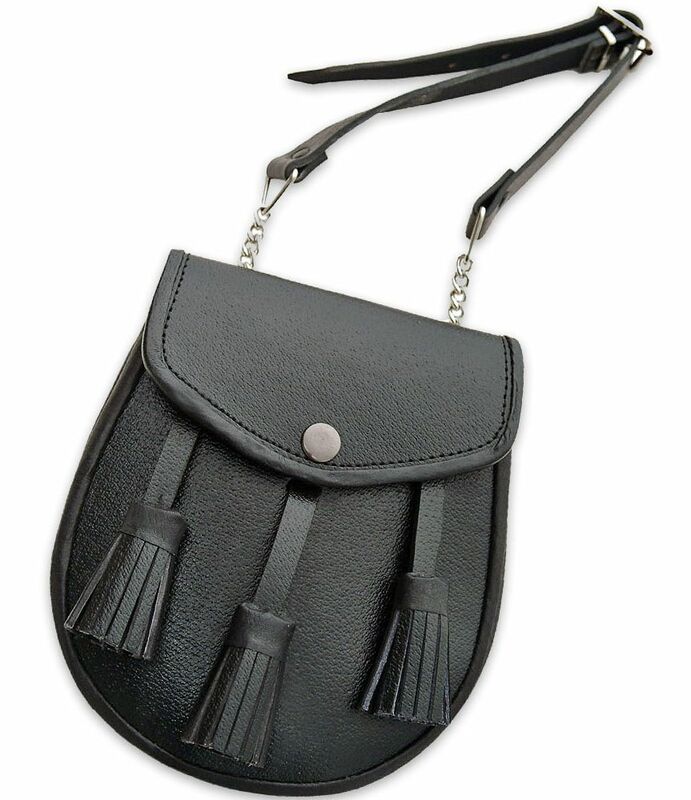 Black leather sporran with 2 tassels. Approximately 4 1/2" x 4 1/4"
Comes with leather sporran strap. Imitation sporran made of felt & rabbit fur with lightweight chain belt for infants. Black leather economy sporran with three tassels. Sporran measures 7 1/2" tall by 7" wide and comes with sporran chain strap. . This economy sporran is crafted of brown and white cowhide, has studded flap and three tassels. Sporran measures 8" tall by 7 3/4" wide and comes with sporran chain strap. 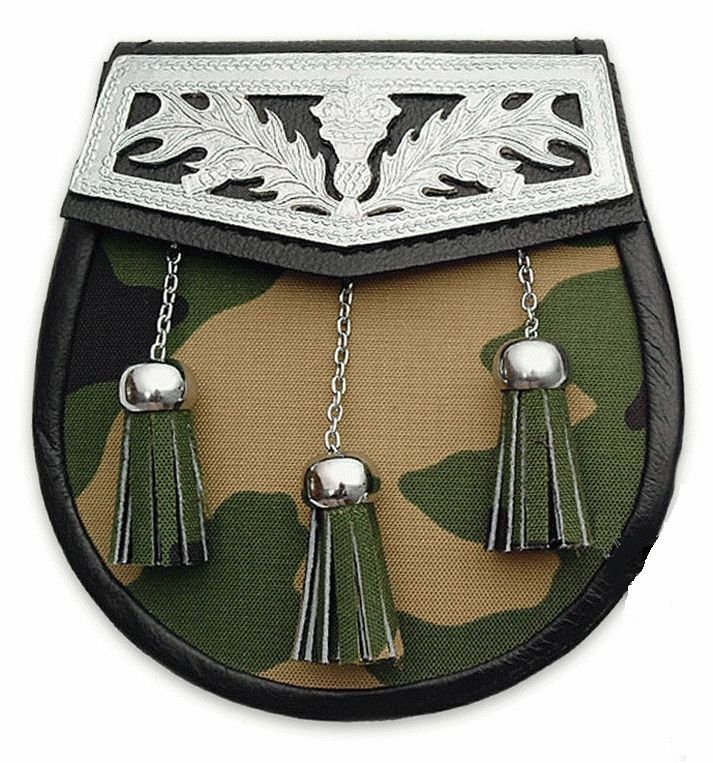 Black leather economy sporran with camouflage canvas front, three tassels, and chrome thistle top. Sporran measures 7 1/2" tall by 7" wide and comes with sporran chain strap. .
All our Fur Sporrans come with a sporran chain strap. Black Muskrat fur with chrome top. Imitation white fur with chrome top. 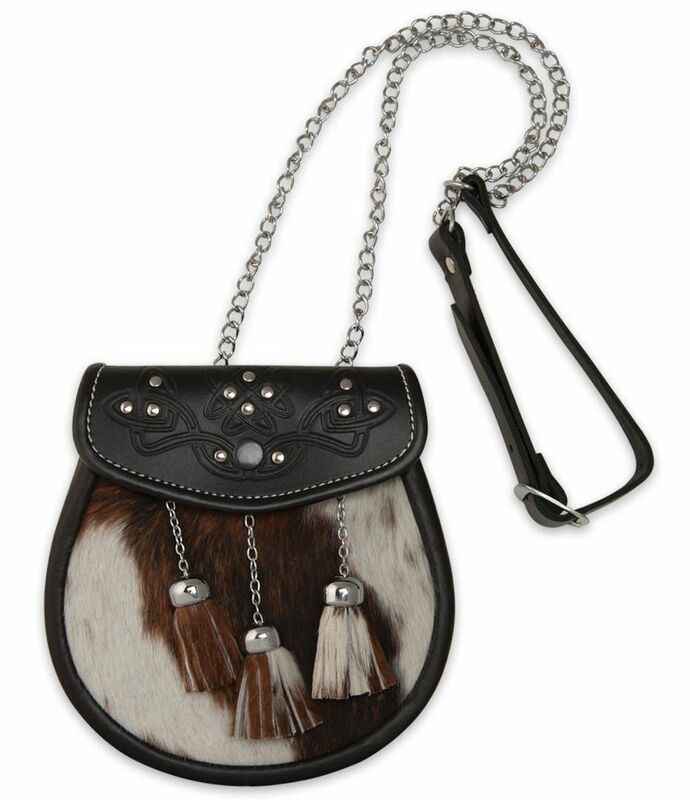 White Calf skin fur sporran with black tassels, leather targe, and chrome top. come with sporran chain strap. Embossed dark brown leather sporran with rabbit fur. 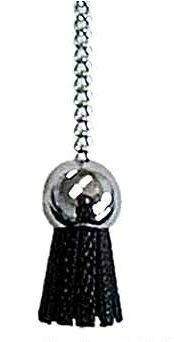 Black leather with Clipped Calf front, stud flap, 3 Calf Tassels on Chrome Chain & Balls. Note: As calf is a natural item, coloring and spots will vary from pelt to pelt Includes sporran chain strap. Available in black or brown leather. Child size. Available in black or brown leather. Adult size. Measures 48 1/2" long. Extra Long Chain Strap measures 58 1/2" long. Chain strap with red lining. Available in black only. Adult size. Measures 48 1/2" long. Available in leather with chain. Single units or sets of 3. 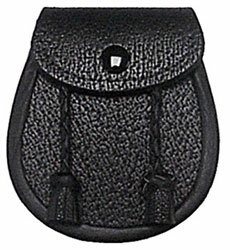 Braided leather replacement tassles for sporrans. Want to change from a sporran strap to a sporran chain strap? Black leather strap inserts into back of sporran so a chain strap can be attached.